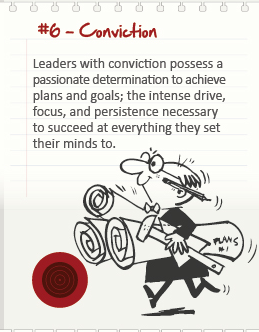 Leadership Qualities – how close to the mark are you? Came across this infographic in my Scoop-It feed this morning and I couldn’t resist reflecting on its message. Schools are awash with opportunities for leadership building and modelling at 3 distinct levels – Peer Leadership (School Leadership teams/Curriculum leadership teams or individuals), Teacher-leading-Class and Student Leadership. It is telling to ponder the impact these 8 key leadership qualities can have in improving school environments and, as a result, performances. Peer Leadership: The keyword for me here is PROACTIVE. Tough decision making means knowing what may go wrong but being a believer in what can go right. 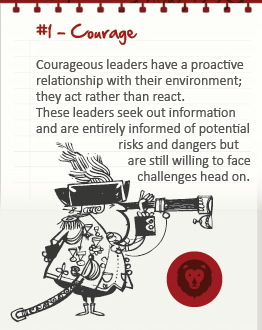 Courageous leadership means not reacting to every bad standardised test result and looking for another solution because Plan A didn’t work straight away. This just leads to one unfinished project after another that never really leads to sustained improvement and consistent achievement. Real change and improvement takes time. Courageous leaders know this and can face the short term criticism that may come their way. Teacher-leading-Class: We can’t expect one lesson to solve all learning difficulties in one go. Teachers have to have faith in programs that have been proven to be successful elsewhere and not cave in to change because things haven’t gone smoothly straight away. Students get confused with constant change and won’t learn to persist if we don’t. Student Leadership: To prepare our students for the future, we need to develop courageous decision making skills in them. Good brainstorming and discussions of positives and negatives are essential in this preparation. Peer Leadership: Probably my biggest drawback is thinking of myself as the expert who has all the answers, although through blogging, Twitter and Edmodo I have come to accept that others have insight and skills I don’t possess. 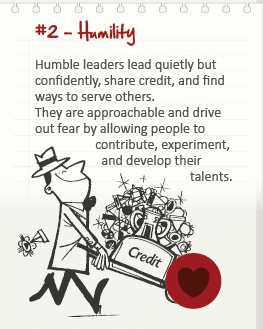 Other key messages out of the Humility point here is not putting yourself above others and telling colleagues you are leading to do things while contributing little yourself. Less experienced teachers want to contribute and develop; but they also crave advice from leaders. Leaders have to get in and do the hard yards with their teams, not delegate in the name of distributive leadership and take credit without contributing. Teacher-leading-Class: Recognise the contribution your students can make to the learning in your grade. Share the front of the class with others, whether they be students or other staff who can contribute to the teaching and learning. Give credit to others who contributed if improvement is noticed. MOst likely you didn’t do it alone. Student Leadership: Don’t over emphasise one group of students over the other. Make sure everyone has a chance to contribute. ‘Catch’ the quiet achievers and the less able succeeding and encourage them to share their learning so that the ‘smart kids’ in the grade realise they aren’t the only ones who know stuff. Give everyone the expectation to lead so that the regular leaders don’t get ahead of themselves. Peer Leadership: Distributive Leadership should not be used as a way of handing all responsibility over to others so they can take the fall for problems. Everyone is responsible for every result. When survey results show some issues exist, don’t look for excuses why the questions and results could have been misinterpreted. Analyse critically and reflect on what could be the real reasons. If we don’t take the time to find out why and accept these reasons, improvement won’t happen. Teacher-leading-Class: Sometimes, it is the teacher’s fault. We were not adequately prepared, we didn’t address the learning gaps effectively, we over-reacted and got too emotional, we didn’t stay focused. If we have a hard class, we have to work harder. If we have a dream class, we should still be working hard to extend them. It is easy to lay the blame on the class, and they can contribute to the problem. But if they see a teacher always passing the buck, they will learn to be unaccountable. Sometimes they don’t have good role models in being accountable in their lives; we need to be that role model. Student Leadership: Our students do need to learn what accountability is about. In group work situations, ownership for results has to be attributed to those responsible, for success and failures. If a child makes poor choices, he need to be made aware of that and there has to be logical consequences. 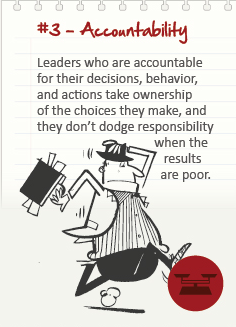 If students are going to develop leadership skills, they have to learn to be accountable. They can’t rely on parents or teachers to do it all for them. Peer Leadership: In the words of Jesus of Nazareth,” Do to others as you would have them do to you.” Also known as “practise what you preach”, Trust isn’t earned by leaders who are inconsistent. Don’t expect hard work if you don’t work hard. Don’t expect others to give if you only take. Don’t play colleagues off against each other. GIve credit where credit’s due and give criticism where criticism’s due. Respond to criticism of yourself honestly, admit fault and be open about how you can improve. Teacher-leading-Class: All of the above. If your students see you admitting fault, following the advice you dish out to them, acting the way you said you would, they will learn what being trustworthy means. Explain yourself if you change your mind, be consistent towards all students, don’t hold grudges, start each day afresh without any agendas against individuals despite their previous sins. One thing children react to is fairness. They may not always like what we do, but they accept it if it is fair and consistent. 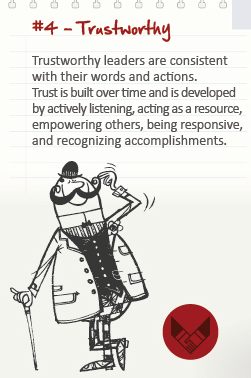 Student Leadership: Be the role model mentioned above so students can learn what being trustworthy is all about. Have high expectations of them and demand consistency and honesty. Expect them to explain their actions and own up to their actions. 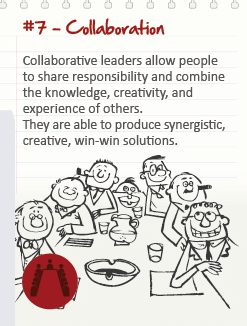 Demand they co-operate with each other and follow through on work that is expected to be done collaboratively. Peer Leadership: Keep lines of communication open at all times between meetings so discussions can continue beyond the meeting. Have high expectations that everyone contributes consistently. Be honest. Don’t put your grievances forward in the car park. Be professional. Allow for disagreement. Expect disagreement. Respect disagreement. Teacher-leading-Class: Don’t dominate the conversation in class. Use technology to allow for everyone to share their opinions. Have high expectations that every child will contribute. Set up an environment that allows this to happen. Allow for disagreement. Expect disagreement. Respect disagreement. Student Leadership: Don’t allow small pockets of students to dominate the class discussion. Don’t expect silence in class at all times. Teach students HOW to listen and respond. It’s not a simple skill. Give students a forum for discussion of issues. Allow for disagreement. Expect disagreement. Respect disagreement. Peer Leadership: Passion is the keyword for me in this little grab. You have to be convincing about your plans. Going through the motions to tick off a list of recommendations does not bring about lasting change. Related to Courage earlier, leaders who are convinced about and committed to their vision will be able to battle through the inevitable pitfalls. Allowing plans to fall by the wayside because something else comes up does not bring about lasting change. Leaders need to stay true ot their convictions. Teacher-leading-Class: Students have very good ‘lack of commitment’ sensors. They know when a teacher is going through the motions and they respond accordingly. Take them on a passionate journey of discovery and even the toughest ones will join you. They will commit to the cause too. But they will jump ship just as quickly if you don’t maintain the rage. Student Leadership: If we cut students off every time they discover a passion worth pursuing, they will lose the courage of their convictions quite quickly. We need passionate, committed leaders for the future. Too many politicians show students that its OK to change your mind every time a poll doesn’t go your way. We have to develop the quality of conviction in our students as future leaders. Peer Leadership: Collaborative decision making does not equal universal agreement but it also doesn’t mean contrived discussion on an issue a group of leaders have already made a decision on. Collaboration takes time, communication, honest feedback ( giving and receiving), evidence based opinions and creativity. It doesn’t happen as a result of 2-3 disconnected meetings over a time frame of 6-8 weeks. Leaders today need to embrace the collaborative nature of technology that allows for constant discussions, sharing of new research, arguing points of view without being verbally cut off mid sentence and time for reflection. Teacher-leading-Class: All of the above. One of the 4 Cs of 21st Learning is Collaboration. We have the tools in our classrooms to embrace this well. Teachers can show how to be collaborative leaders by allowing this technology to take over the day to day running of discussions. Too often, collaboration is mistaken for brainstorming and sharing. Student Leadership: Ditto. Students have to be taught how to collaborate. Group work is not dividing tasks up and getting the dedicated students to do most of the work. 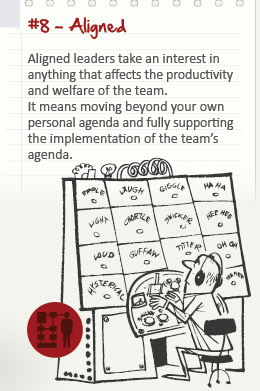 Peer Leadership: “Moving beyond your own personal agenda” – Love that statement! ( and I’m as guilty as anyone of pushing my own agenda) You can have all of the other qualities listed above but it all falls apart if we are divided. While curriculum teams need their own meeting times, decisions have to be made with all involved present at all times. Last time I looked ,there are still only 24 hours in a day and 5 working days in a school week. If we added up the hours individual curriculum leaders needed to achieve their goals, there would need to be a substantial shift in the nature of the space-time continuum for it to actually occur. Splinter groups can’t solve the issue but committed discussion that involves aligning goals and finding ways to combine goals, targets and agenda can. Teacher-leading-Class: Not so much with the students but more at planning level, team members need to align their individual passions and challenges to ensure a balanced curriculum for the students. Student Leadership: Teaching compromise is a starting point here. Granted, it can be hard for children. I’m under no illusions that I am any great role model for leadership. I choose teaching children over leading schools every year (although I have spent many years on leadership teams by virtue of my skill set and experience). Nevertheless, you don’t have to wear a badge that says Principal or Co-ordinator to understand the qualities and behaviours needed by leaders. Many schools need improving in this world of ours. 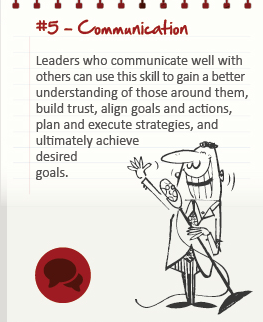 These Leadership qualities are vital for success. Standardised testing – Who’s at fault? System, teacher or student? Pt 1 – The System. I had been planning to weigh in on the Standardised Testing debate for a while now. 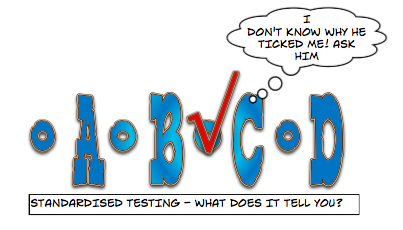 Then I spotted this article titled The four biggest myths of the anti-testing backlash and decided to put my ‘two cents worth’ in. First of all, don’t call me a fence sitter, but I can see what both sides are saying. And that’s part of the problem with the whole debate. It’s just two sides not listening to the other’s point of view. Being a quasi/mutant part teacher, part leader composite being, I get to discuss the postives and negatives of testing with many stakeholders and this is where it all sits with me. At system level, no one has a coherent, unified explanation of the purpose of Standardised Testing. Is it for tracking student progress or achievement? Is it a means of evaluating the performance of schools, teachers or students? Is it a “one off snapshot of performance to get a general picture of student achievement to be used alongside school/teacher recorded data to build a profile of a student’s strengths and weaknesses” ( phew!) or is it the all important indicator of school and teacher performance that takes precedence over all other evidence of achievement before or after the test? Are we meant to use the results to guide curriculum and school planning or work with the results at a one to one level to build on Individual Learning Plans for students? Are the results intended for educational experts or meant to be published by newspapers and government websites to pigeonhole schools into rankings based on a one off event? Over the years, I hear and see all of these scenarios played out all the time and the end results too often don’t result in targeted learning improvements because we get bogged down in definitions of purpose and mixed agendas. Testing is necessary. In a mobile, global society, there needs to be some standard we have to set for the typical 10 year old if one year their Dad’s job takes him to Thailand and the next year he ends up in Dubai. Results can be used effectively. Trends can be found at a class or school level that can be addressed quickly. Results can generate purposeful planning conversations based on actual data rather than teacher intuition or generalisations based on a small sample group. Done well, students and their parents can get timely feedback that they can use to address strengths and weaknesses quickly, not when they get their report five months later. Despite what we think, many students like competition and like to know how they are performing against their best mate or nemesis. So I am not against the concept of standardised testing. I have issues with its perceived purpose. I’ve spent the last 3 weeks at school using a lot of standardised tests. We believe at the leadership level, we have a clear purpose for these tests. The On Demand testing we are using online with entire Grade Levels can give us a snapshot of who is below, at and above standard. From there we plan programs to address needs of groups of students. It’s instant feedback – which is a massive advantage over the ridiculous 5 month waiting period for NAPLAN ( Australia’s nation wide standardised testing program) . The minute the student finishes the test, we can bring up overall and question by question results. But the amount of data can be overwhelming at the micro-level and too general at a macro level. More importantly for me, raw numbers and right and wrong answers tell me what the student can’t do BUT it doesn’t tell me why. That’s why a more effective form of standardised testing is the one on one interview. Too time consuming to do with every student and often too pointless to use with high achievers or the ‘normed’ student, but what you get the chance to do that makes a real difference to the student’s learning is identify how they think. A instead of C doesn’t tell me why the child couldn’t add two digit numbers; listening to that same student verbalise the misconceptions of addition does. Where standardised testing of the written, whole class nature helps me here is identifying the students who would benefit from the interview. Over the last week, I have had some eye opening interviews and discovered some major issues with some students that NAPLAN and On Demand or class worksheets clearly missed. I’ve also found out that some of the students I interviewed because of Standardised Test results, were not low achievers at all. They were using sophisticated mental computation strategies that will support them in future years and should have helped them ‘ace’ the test. Something else was going on at the test site that a written test can’t begin to pick up. I don’t know how possible it is but it would be nice if at system level someone could investigate the possibility of an alternative to the 50 question multiple choice question test. Is our priority the Collection of Data about WHO is at risk or finding out HOW we can help the at risk student? I don’t know how practical it is at a system level, but 5 questions on key ideas that ask a child to justify their responses is going to tell me more about what is going on in the head of that student than a score of 12/50. Testing is vitally important but it’s important to find out how to help our students learn, not simply what they do and don’t know on a given Thursday. Identifying learning issues is what I want to see as the purpose of Standardised Testing. That helps teachers. That helps students. Anything else becomes a political football in a debate between two groups of people who are only providing the media 1o second soundbites to keep the real stakeholders out of the conversation. Having said that, it is certainly not all the system’s fault. Teachers and students have to be accountable in all of this too. What roles, rights and responsibilities do those at the coalface have in this debate? I’ll cover that in Pt 2 ( or maybe even Pt 3 – depends on how much I ramble on for!!) In the meantime, I’d like to hear what you think? What’s your take on Standardised Testing? Which side of the debate do you support? Join the conversation.